Written by Nutter Custom Construction on December 31, 2018 . Posted in Blog, Custom Construction, Tips and Tricks. When designing the exterior of your home, you’re probably thinking about the siding, the windows, the porch, and so on, but don’t forget the gutters! Gutters are one of the most overlooked elements of the exterior of a home. For tips on selecting the perfect gutters for your home, just continue reading. Did you know gutters come in various sizes? Make sure to select the appropriate size gutters for your home. Different sizes accommodate different amounts of water that collect on a roof. Think about how much rain your area gets before selecting gutters for your home. Also, think about how much potential debris could collect in your gutters. Leafs, pine needles, and so on can collect in the gutters and cause back up, but larger gutters allow for more flow. Gutters also come in different shapes. K-style gutters are a choice that shoppers can choose for their home. These gutters have a decorative bottom and a flat side, adding a crown molding effect to a home, and effectively collecting rainwater. The second shape is half-round, which looks like a half circle with an open top. Half rounds come in different materials, including galvalume, copper, and zinc. This option is more expensive but may be more effective for your home. The final type of gutter is box style gutters. Box style gutters are square in shape and frequently used on residential buildings. Once you select the appropriate size and style gutters for your home, it’s time to purchase gutter guards. Gutter guards are added to the top of gutters to minimize the collecting of leaves and debris. Most gutters come with a recommended gutter guard style so you know they’re cohesive. 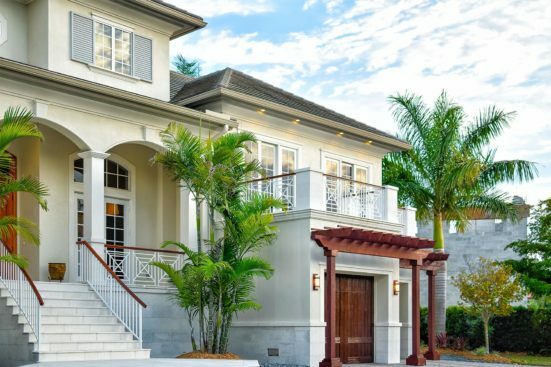 If you’re in the process of building or remodeling your home, contact Nutter Custom Construction. Our team of professionals can help you achieve your dream home. For more information, give us a call at 941-924-1868 today!